I agree completely with these notes. The wines are fermented using native yeasts, then aged in a combination of puncheons and large barrels made of French oak, and they show extraordinary elegance, a characteristic that is not always the first thing one notices about Brunello di Montalcino, as well as the acidity and fine tannins that promise a long life in the bottle. Leanza is one of the three founders of Sangiovese Per Amici, a group that was set up to represent an alternative to the Consorzio of Brunello di Montalcino, which many observers feel is not a trustworthy guardian of the appellation after the Brunellogate scandal of a few years ago, and subsequent efforts to allow non-traditional varieties in Rosso di Montalcino. The grapes for the Rosso di Montalcino come from the Sorgente vineyard at 460meters, just behind the winery and less than a hundred meters from the Piaggone vineyard. 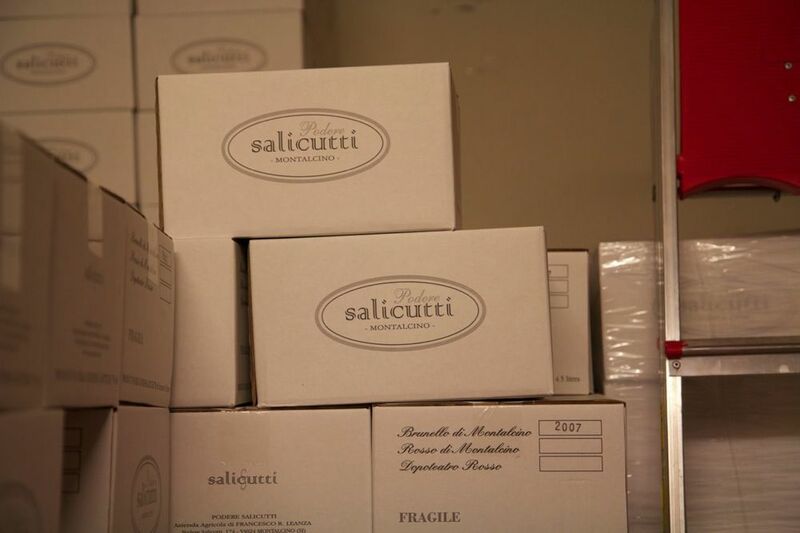 While many producers use fruit from their younger vines or less desirable grapes to make their less expensive Rosso bottling, Podere Salicutti's Rosso is in fact a vineyard designate. The vines were planted in 1994 and 2001. The soil is calcareous with a mixture of clay, sand, and stones. Because of the exposition of this vineyard, the grapes ripen about a week later than the two Brunello vineyards. 100% Sangiovese. Stainless steel fermentation and maceration for 9 days. The wine is aged in 5 hectoliter french Allier barrels for 18 months and then aged further in the bottle for 6 months before release. 5300 bottles produced. The grapes for the Brunello di Montalcino come from two vineyard sites just a few hundred meters apart. These grapes are grown at altitudes between 420 and 470 meters in a stony soil with a high lime content. The majority of the vines were planted in 1994 with a small additional section of Sangiovese planted in 2007. The Piaggone vineyard site has the steepest gradient and because of its exposure and climactic conditions, it produces grapes with a higher sugar content and a resulting wine richer in polyphenols and more intensely colored. 100% Sangiovese. Stainless steel fermentation and maceration for 18 days. The wine is aged in a combination of 5, 10, 20, and 40 hectoliter french and slavonian oak barrels for 3 years and then aged further in the bottle for 8 months before release. 8000 bottles produced.